Rob Landes, a member of The Church of Jesus Christ of Latter-Day Saints, has been playing the violin since he was three years old. He became so good at playing that, according to his website, he performed with the Disney Young Musicians Symphony Orchestra on the Disney Channel. When he got older, he was offered full-ride scholarships to multiple universities. He accepted the scholarship from BYU where he earned a master’s degree in music. He has been a solo violinist for many prestigious symphonies in Utah including the Utah Symphony, Utah Valley Symphony, the BYU Philharmonic, and the BYU Chamber Orchestra. When he was the concertmaster of the BYU Chamber Orchestra, he played in Carnegie Hall to a sold-out audience. Lately, Landes has been creating amazing harmonies using a loop pedal, which allowed him to create this amazing rendition of “Hallelujah” for which he won “Best Instrumental” at the 2016 Utah Music Awards. Landes also played in Thailand where he did a three-week tour. Here is one of the songs he played there, a cover of “Love Yourself” by Justin Bieber. Traditional musicians and dancers from Thailand performed with him to create a stunning cultural work of art. Rob Landes has been getting noticed on YouTube for creating covers of popular songs, including “Shape of You” by Ed Sheeran, “Hello” by Adele, “Radioactive” by Imagine Dragons, a mashup of “Paris” and “Closer” by The Chainsmokers, “7 Nation Army” by The White Stripes, Star Wars music, “Rise” by Katy Perry ft. Aaliyah Rose, “The Sound of Silence” by Simon & Garfunkel, and, my personal favorite, “Thunderstruck” by AC/DC, to mention a few. Visit his YouTube channel to see all of his amazing covers. 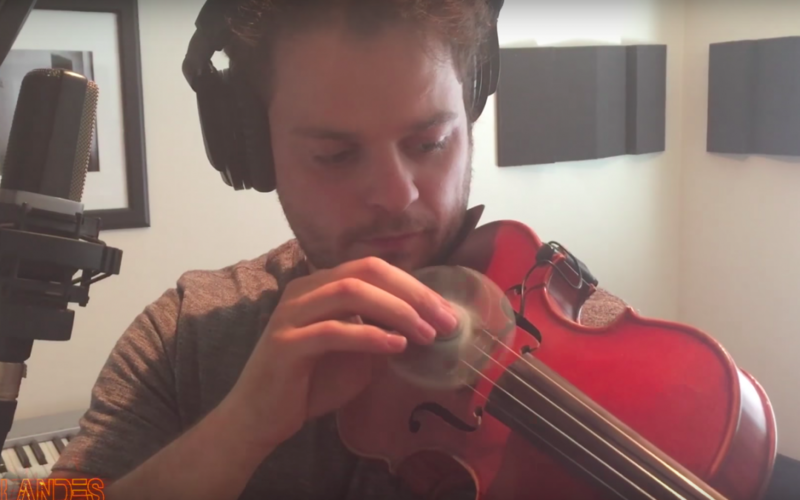 Most recently, Landes has using a fidget-spinner to create a unique sound on his violin. Here’s a video of him playing “Billie Jean” by Michael Jackson with a fidget spinner and a loop pedal. And here’s an original song he wrote for the fidget spinner. Jeff, Thanks for commenting. We agree!